The Denver metro area is a wonderland for vintage houses. Here’s an overview of the primary local historical styles, how to recognize them and where to look for them in your search for the perfect place to call home. Popular in the 1930s and 1940s, Art Deco homes are easily recognizable for their bold color juxtapositions, eclectic ornamentation (often with glass and metal) and striking geometric shapes. Known for embracing the emerging technology of the machine age, the Art Deco movement used the straight lines and symmetry of mass produced materials to produce everything from zigzags to chevrons to floral motifs. The Bonnie Brae, Hilltop and Park Hill neighborhoods in Denver feature many excellent examples of Art Deco homes. Bungalows became extremely popular in the Denver area between 1910 and 1930. Relatively small in size, they are normally either one-story homes or two-story homes with dormer windows built into sloping roofs. Denver bungalows were typically built in the Craftsman style, but often include Queen Anne, Swiss or Japanese influences as well. Highly utilitarian, bungalows were known for their earth tones, hardwood floors, built-in cabinets, handsome fireplaces, exposed wood beams, stone chimneys and large front porches. By the early 1900s leading up to World War I, companies like Sears & Roebuck, Montgomery Ward and the Aladdin Company were selling bungalows in styles that included Arts & Crafts, Colonial, Spanish and Tudor. You’ll find numerous stunning bungalow homes in Denver neighborhoods like Congress Park, Park Hill, Platt Park, Sloan’s Lake and Washington Park. The Colonial Revival Movement first took off in the 1890s and continues to this day. Colonial homes, which often include elements of the Federal, Georgian or Neoclassical styles, feature rectangular floor plans, impressive front entries, rounded windows, pediments and gables. Considered part of the Colonial Revival, Dutch Colonial homes have a barn-like appearance based on their dual-sloping gambrel roof and flaring eaves that extend over the sides. You can find Colonial and Dutch Colonial homes throughout Metro Denver, with many older examples in Denver neighborhoods like Bonnie Brae, Cherry Creek, Congress Park, Country Club, Hilltop, Park Hill and University Park. The American Arts and Crafts movement was the impetus for the American Craftsman architectural style that began in the early 1900s and remained popular into the 1930s. The style was known for its sturdy look, clean lines and use of natural, handcrafted materials like wood, glass and metal. The name Craftsman derived from a popular magazine called The Craftsman, which was founded in 1901 by Gustav Stickley. Frank Lloyd Wright, who was one of the Craftsman style’s biggest proponents, would later become one of the originators of an outgrowth of the Craftsman style known as the Prairie School. The terms ‘Craftsman’ and ‘Bungalow’ are often used interchangeably because of the Craftsman Bungalow. In fact, Craftsman style homes include the Bungalow as well as the Clipped Gabled Craftsman, Cottage Style Craftsman and Colonial Craftsman. Although most Craftsman houses are indeed bungalows, not all bungalows are Craftsman style. Common Craftsman features include low-pitched roof lines, deeply overhanging eaves, exposed rafters, front porches and handcrafted stone or woodwork. You’ll find many Craftsman homes in Denver neighborhoods like Berkeley, Congress Park, Country Club, Highlands, Mayfair, Park Hill, Platt Park, Washington Park. Known locally as Denver Squares, American Foursquare homes became very popular after the Silver Crash of 1893 and remained en vogue through the late 1930s. Unlike Victorian homes, Denver Squares are known for their less ornate, more utilitarian style. Normally 2½ stories high, they feature a boxy design with four large square rooms on each of two equal-sized main floors. Common features include large front porches, high ceilings, arched entryways, hardwood floors, tile fireplaces, leaded glass windows and built-in cabinets. By 1908, Sears and Roebuck began shipping Foursquare home kits by train for local builders to construct. As the first modular homes, they came with a base construction cost of just $3,000. Whether they originated from plans by Sears or competitor manufacturers, Foursquare homes (which share many common elements with Craftsman homes) were generally built with high quality materials, and most homeowners of the day took it upon themselves to add their own distinctive design touches. Today, they remain a popular local home choice that’s relatively easy to update and remodel. You’ll find most Denver Squares in Capitol Hill, Cheesman Park, City Park, Denver Country Club, Highlands, North Congress Park, Platt Park and Uptown. The International style first emerged in the 1920s and 1930s and originated from a book by the same name that identified the key characteristics of modernism across the world. The style is based on modern structural principles and focuses on the use of materials such as concrete, glass and steel structural supports. Much like the Bauhaus philosophy, followers of this style avoided decoration based on the belief that form should follow function. Uniquely American, Mid-Century Modern homes share many traits with homes built in the International Style, but tend to be less formal and somewhat more organic in form. The highly practical, family friendly 1950s Ranch is one example. 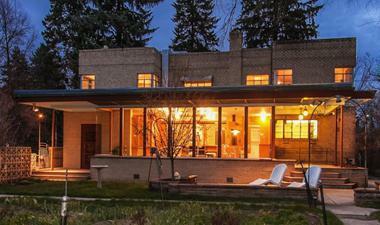 You can find International Style and Mid-Century Modern homes across the Denver Metro area, with some of the finest examples in the Bonnie Brae and Virginia Village neighborhoods of Denver. The Mission Revival style was popular between 1890 and 1915. It then evolved into the larger, more decorative Spanish Colonial Revival style, which saw its peak between 1915 and 1940. Both drew inspiration from the Spanish missions built in California in the late 18th and early 19th century. The Mission style features stucco or plaster walls with minimal decoration. Its most distinctive feature are its curvilinear parapets that extend above its flat rooftop. Like its predecessor, Spanish Colonial became popular in Denver in part because the dry sunny climate was so in keeping with Spain and California. Like the mission style, it features tile roofs and plastered, thick walls that keep houses warmer in winter and cooler in summer. What separates the two is that the Spanish Colonial style is typically two stories and is more elaborately decorated with its tile roof, balconies, elaborate tile work and decorative ironwork. You’ll find hundreds of both styles throughout greater Denver. The Pueblo Revival style started at the beginning of the 20th century and reached its peak of popularity in the 1920s and 1930s. During that period, the Denver elite was becoming increasingly interested in the arts and architecture of Santa Fe and Taos. The missions and pueblos of New Mexico provided inspiration for the new style with its rounded corners, thick adobe-like walls, parapets and trademark wooden beams that projected out of the side. Solid and stylish, Tudor Revival homes became the most popular choice in the Denver area in the 1920s and 1930s. These homes had a simple, rustic appeal that harkened back to medieval cottages. Considered a reaction to the compact Bungalow, Tudor homes were built with steeply pitched roofs, front and side gables, half timbering, elaborate brickwork, terra cotta details, high chimneys and tall casement windows. On the inside, they often included grand front rooms, beautifully crafted iron and mahogany doors, crystal doorknobs, coved ceilings, elaborate oak trim and floors, wood fireplaces and elaborate fixtures. In Denver, Tudor homes were constructed almost exclusively with stone and brick. You’ll find some of the best preserved Tudor homes in neighborhoods including Bonnie Brae, Country Club, Crestmoor, Hilltop, Montclair and Park Hill. The Victorian era extended from the mid to late 19th century and actually covers a number of eclectic architectural revivals, many of which include Middle East and Asian influences. Queen Anne Homes are the most ornate of the Victorians. Known for their asymmetry and use of contrasting materials, these homes typically included extravagant features like massive bay windows, turrets, wraparound porches, exquisite balconies, decorative fish-tail shingle patterns, tall brick chimneys and stained glass. Stick Homes, which are more linear, less formal versions of the Queen Anne, feature decorations like lacy balconies and beaded spindles. Folk Homes were considered the ‘working class’ Victorian style and usually came without the elaborate bay windows, balconies and a variety of decorations. Regardless of the particular style, Victorians remain in high demand in Denver. Neighborhoods where you’ll find the most Victorians include Baker, Capitol Hill, Cheesman Park, Congress Park, Curtis Park, Five Points and the Highlands.